I've been wanting to do this FOREVER! 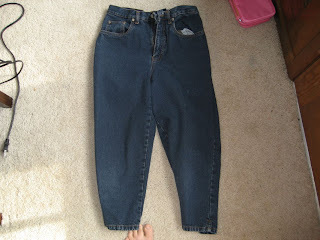 See, I had this old pair of Bill Blass capris. I found them on a clearance rack at Ross or Marshall's, years ago. They served me well until ... well, until I hated them and was bored silly with them. I love tattoos and mehndi art. I can't stand these boring old capris. What to do? What to do? Enter some henna tattoo stencils, a bleach pen and a summer morning! 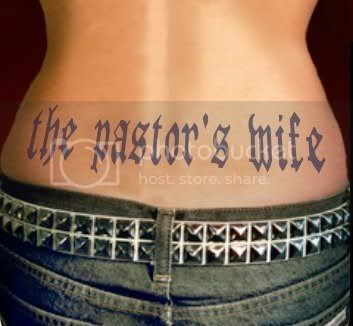 Actually, I first printed out my "the pastor's wife" tramp stamp picture. I laid that on top of some white contact paper and taped it all down to a cardboard box. I cut out the words with an exacto. 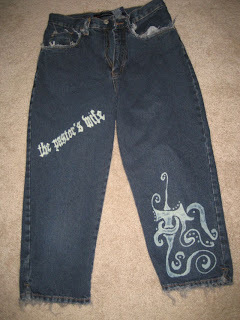 Peeled the stencil I created and stuck it on to the capris. I then filled in the stencil with the bleach pen (I put some cardboard inside the pant legs, in case the bleach wanted to ooze through). I then eye balled a bunch of the tattoo stencils for the rest. I did everything on the front, let it sit 20 minutes, then rinsed with cold water. Ran it through the dryer for a minute, then did the back side of the pants. I then took some scissors and cut around the hems and edging on the pockets and belt loops. Washed and dried and WHOO! HOOOOOOOO! I love them, I love them, I LOVE THEM!!! That is totally cool. Love it! I have some capris that are going to get the Christine treatment as soon as I get my act together. Very Cool. 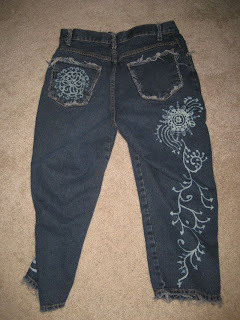 I tried that once with a pair of jeans and bleach pen and mine did not turn out so well. I better look for some good stencils! I think that smooth and swirly designs contribute to its success. Straight and clean lines would just be way too hard to keep - well, straight and clean! What a transformation! Too cool! 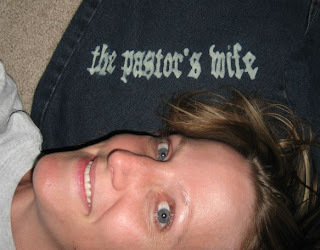 These are so awesome Christine! I love them! I don't quite understand how you got the edging on the legs and pockets, though. But the stencils rock! Anytime you cut denim, wash and dry it, you get that fringy stuff. I think you found a new career!! They look AWESOME! I want a pair! That's awesome. I love to reconstruct clothes and for some reason I'd never thought of using a bleach pen. Great tip! I can't wait to try it! These are totally amazing. You could probably make a fortune if you took orders right here! Thanks for sharing these, they really do ROCK!